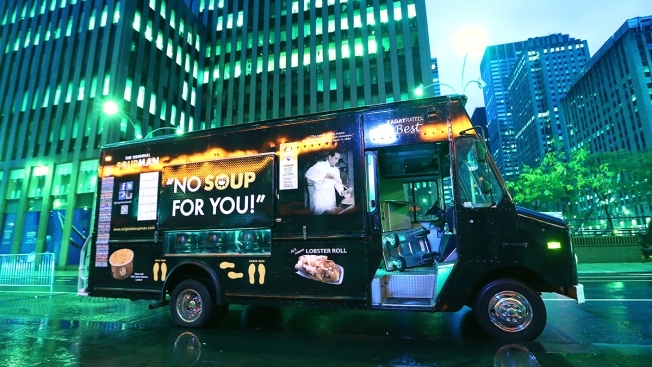 In this file photo, a soup truck stands by before the launch of "The Original SoupMan Soups" in New York City, Oct. 19, 2012. A company that sells soup from the recipes of the chef who was the real-life model of the Soup Nazi on "Seinfeld" has filed for bankruptcy less than a month after its chief financial officer was arrested on charges he cheated the government out of employment-related taxes. Soupman Inc., based in Staten Island, sells soups made from the recipes of Al Yeganeh. Yeganeh and his soup stand were the inspirations behind the "Seinfeld" television show character, who shouted the catchphrase "No soup for you!" The company's CEO, Jamie Karson, said Tuesday that "the combination of legacy liabilities and recent company developments have made it necessary to seek bankruptcy protection." Karson said its products, including jambalaya, lobster bisque and chicken gumbo, would still be available in stores. Last month, CFO Robert Bertrand was charged in Brooklyn federal court with failing to pay Medicare, Social Security and federal income taxes for company employees. The government said he paid employees unreported cash and gave some workers large unreported stock awards from 2010 through 2014. According to the indictment, the total estimated tax loss to the Internal Revenue Service was $593,000. Bertrand, of Norwalk, Connecticut, has pleaded not guilty and has been released on $50,000 bail.